As we covered last week, the long-rumored All Elite Wrestling promotion is officially happening. 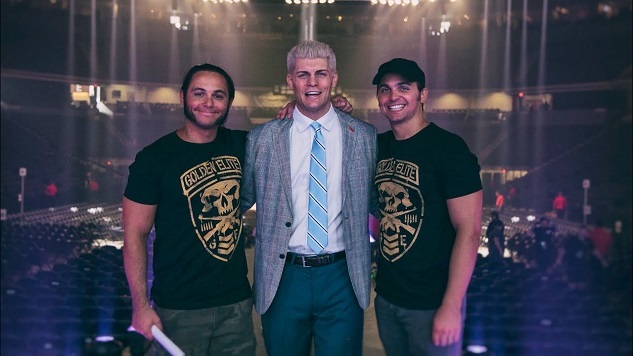 The stable known as the Elite—the Young Bucks, Cody Rhodes and Hangman Adam Page—announced the company on New Year’s Day in the latest episode of their YouTube show Being the Elite. The new company is being launched by Tony Khan, the co-owner of the Jacksonville Jaguars and Fulham F.C., with the Young Bucks and Rhodes serving as Executive Vice Presidents. Brandi Rhodes has been announced as the company’s Chief Brand Officer, and all four will wrestle in addition to whatever office duties go along with their titles. They’ll be putting on a follow-up to All In called Double or Nothing at some point in 2019, although a date and location have not yet been announced. Fellow Elite member and Ring of Honor / New Japan vet Page has also signed to wrestle for the company, as has Britt Baker, who wrestled in WWE’s Mae Young Classic last year. This has all been officially announced by AEW. Meanwhile Dave Meltzer of the Wrestling Observer has reported that the company is weighing multiple TV offers, and although rumors have been kicking around online for days, there’s no credible information about what stations might be interested in AEW. This is what we know so far about the upstart wrestling promotion. We should learn more about AEW later today. The company’s holding a rally in Jacksonville, Fla., today at 5 p.m. ET. It’ll be happening outside the Jaguars’ home stadium, TIAA Bank Field, near Gate 1 in Parking Lot J. If you can’t just pop over to a football stadium in Jacksonville at 5 p.m. on a workday, you’ll able to watch the rally live online in a variety of ways. It’ll be streaming on the Being the Elite YouTube page, on the Facebook page of the Young Bucks, at the Instagram page of Brandi Rhodes, and on the official All Elite Twitter channel. The press release announces that viewers “can expect the unexpected as the rally will showcase the true spirit of wrestling entrepreneurialism and feature special guests,” and if you’re there in person you’ll apparently be able to pick up some unique AEW merchandise. That “special guests” line will obviously spur speculation over Kenny Omega’s future, as the former IWGP Heavyweight Champion and leader of the Elite is supposedly finished with New Japan Pro-Wrestling. It’s also interesting to note that WWE is also in Jacksonville today, with Smackdown airing live from the Jacksonville Veterans Memorial Arena tonight, less than half a mile down the street from TIAA Bank Field. If you’re interested in what kind of shape All Elite Wrestling might be taking, you can stream that rally for more news, or check back at Paste later tonight for a rundown of any significant announcements.